Presiding Bishop Minerva Carcaño of the Phoenix Area surveys results of a May 1 vote on reconsidering retaining guaranteed appointments. The guarantee of an annual appointment for elders was eliminated by the 2012 United Methodist General Conference meeting in Tampa, Fla. A UMNS photo by Paul Jeffrey. Click on image to enlarge.View more photos. A proposal to end guaranteed appointments was approved on a consent calendar. An effort to reconsider the previously approved legislation was defeated by a margin of 564 to 373. Under this new legislation, bishops and cabinets will be allowed to give elders less than full-time appointment. The legislation also would permit bishops and their cabinets, with the approval of their boards of ordained ministry and annual (regional) conference's executive session, to put elders on unpaid transitional leave for up to 24 months. Clergy on transitional leave would be able to participate in their conference health program through their own contributions. Under the legislation, each annual conference is asked to name a task force to develop a list of criteria to guide the cabinets and bishops as they make missional appointments. The cabinets shall report to the executive committees of boards of ordained ministry the number of clergy without full-time appointments and their age, gender and ethnicity. Cabinets will also be asked to report their learnings as appointment-making is conducted in this new manner. Earlier the assembly voted down a proposal that would have allowed elders and deacons to be eligible for ordination as soon as they complete their educational requirements. Delegates celebrated an April 30 decision to enter into full communion with the African Methodist Episcopal Church, the African Methodist Episcopal Zion Church, the Christian Methodist Episcopal Church, the African Union Methodist Protestant Church and the Union American Methodist Episcopal Church. "We have a shameful history of blatant racism that led to the breakup of American Methodism into multiple denominations beginning in the late 18th century," said the Rev. Stephen J. Sidorak Jr., staff executive of the United Methodist Commission on Christian Unity and Interreligious Concerns. Noting the existence of the Pan-Methodist Commission, Sidorak said, "There is some solace in the fact that there has been demonstrable dedication within The United Methodist Church to preserve a special relationship with the historic African-American Methodist churches." Representatives of the Wesleyan denominations were introduced to the assembly. It is not a new insight to discover that United Methodists don't agree on every subject. Delegates opposed, 407 to 383, a longer preamble proposed for the Social Principles by a legislative committee. They agreed with a minority report that affirms "our unity in Jesus Christ while acknowledging differences in applying our faith in different cultural contexts as we live out the gospel." 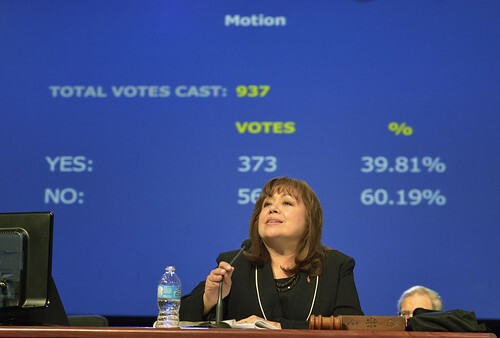 Voting 532 to 414, delegates in a May 1 plenary session added a clause, "We stand united in declaring our faith that God's grace is available to all that nothing can separate us from the love of God in Christ Jesus." Some delegates argued against the added sentence saying that belief and action can separate us from the love of God in Jesus. Others suggested that there is a difference between God's love for all and human response to that love. The full introductory statement was approved 632 to 302. General Conference voted 889-20 to make United Methodist Women an autonomous agency. That action is mirrored in every structure presently under consideration by the conference. Up to the present time, United Methodist Women has been a division of the United Methodist Board of Global Ministries. Before 1968, the organization, known as the Women's Society of Christian Service, was also related to the Methodist Board of Missions. "This is a great result for United Methodist Women and for the church and positions us for the next 143 years of mission," said Harriett Jane Olson, chief executive of the international United Methodist Women organization. General Conference also approved a series of recommendations to strengthen ties between local United Methodist Women members, their national structure and the ministries they support. The actions will provide more flexibility to local, district, conference and jurisdictional United Methodist Women as they organize for mission in their respective communities. In a separate vote, oversight of the denomination's deaconess and home missioner programs was placed with the new national United Methodist Women organization. Noting the presence of more than 1 million Tongans, Samoans, Fijians and native Hawaiians living in the United States, delegates approved a sixth national plan for Pacific Islanders. The sixth racial/ethnic national plan will provide resources for 80 U.S. churches, congregations and fellowships ministering to Pacific Islanders. "There will be a special focus on health in addition to the three other areas of focus," said Nam Jin (NJ) Jun, executive secretary of Asian American and Pacific Island ministries at the Board of Global Ministries. "For the past 25 years, Pacific Islanders have been trying to have a national ministry plan." The group is asking for $500,000. Delegates revised the Social Principles statement on abortion to say, "We mourn and are committed to the diminishment of high abortion rates." Churches are encouraged to provide "age-appropriate sexuality education, advocacy in regard to contraception, and support of initiatives that enhance the quality of life for all women and girls around the globe." Churches are also encouraged to support "crisis pregnancy centers and pregnancy resource centers that compassionately help women explore all options related to unplanned pregnancy." Created the Burundi Annual Conference. Burundi has been one of five countries currently included in the East Africa Annual Conference. The new Burundi Annual Conference will be a part of the Africa Central Conference. Referred to the Board of Global Ministries a petition asking for the exploration of a ministry that could provide financial assistance to the poor by counseling, loans and gifts. The Board of Global Ministries is working with a group of large-membership churches in the United States to develop a microfinance program. Agreed to allow those proposing a new structure plan to provide an errata sheet in the May 2 issue of the DCA. The proponents also arranged for translations of the document at the UMC.org website. Agreed "to take faithful steps to live more fully into what it means to be worldwide church in mission for the transformation of the world (and) to full equity and accountability in our relationships, structures and responsibilities for denomination." Asked annual conferences to establish committees on Hispanic/Latino Ministries and encouraged local churches to name a coordinator of campus ministry. Noted that the war in Afghanistan costs more than $100 billion per year money that beats plowshares into classrooms and hospitals into weapons delegates approved a resolution calling for the "prompt and complete withdrawal of U.S./NATO forces as a necessary step toward demilitarization and reconciliation in the region." They also called for the U.S. to shift resources from military spending and training to health and education. Updated a resolution on social justice that expresses concern about global ecological crises from poisoned soil and waters to deforestation and the destruction of mountains. Agencies are asked to report to General Conference on how sustainable environment practices have been introduced into their ministries. Encouraged United Methodists in the U.S. to "reach out to local synagogues, mosques and Christian faith groups about how to promote justice and peace in the Holy Land." The resolution also supports "military aid by any country to those parties in the conflict that commit human rights abuses." Recognized retiring bishops and new officers of the Council of Bishops. Created an additional episcopal area in the Congo Central Conference, increasing the number of bishops in the area from three to four. Received greetings from Louise Short, 106, widow of Bishop Roy Short who was elected to the episcopacy in 1948, and served for many years as secretary of the Council of Bishops. *Peck is a retired clergy member of New York Annual Conference attending his 12th General Conference, including four times as editor of the DCA and three times as a member of the UMNS news staff. News media contact: Maggie Hillery, Tampa, Fla. (813) 574-4837 through May 4; after May 4: (615) 742-5470 or newsdesk@umcom.org.